AC01. Polkhovsky (blue scarf) - 5n, 6"
The village of Polkhov Maidan, now called Gorky, is East of Moscow. Dolls are painted with water-soluble aniline dyes and India ink. 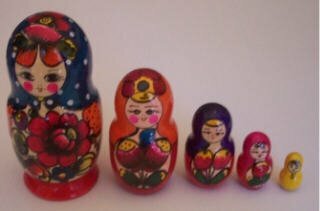 Dolls are taller and thinner than Semenov. Smaller faces, often with curly black hair, sometimes blonde, brown or orange hair. Fingerprint patterns on head and large two-toned flowers on apron. Traditional Polkhov flowers and buds. Each doll has a different color scarf and hairstyle. Largest doll has orange hair parted in the center. Translucent aniline dye lets the wood grain show through.